When playing around with a camera, the first thing you have to do is pick it up and start playing around with the buttons. Many casual snap shooters ignore this fact and buy a camera without ever giving it an in-hand “test drive,” preferring the spec sheet instead. Real photographers? They always like to get touchy-feely with their cameras before deciding for or against a purchase. For these people, in-hand feel and positioning of buttons is often a make or break feature more so than the image quality itself. At first look, the D700 is extremely intimidating, especially to a beginner who is used to having a lot fewer buttons on a camera, whether it be P&S or dSLR.. Now, while there is a learning curve to the camera, the great news is that, once one becomes proficient with the controls, you can change every vital setting without ever having to enter the menu system, which is a capability that sets the D700 apart from the scores of lesser cameras on the market at the entry and prosumer levels. Nikon D700: the back controls.Starting on the back side and at the upper left of the D700, there are two buttons that will allow you to enter playback mode and delete pictures. While the enter playback button is standard across all models and makes, the ability to delete images without menu diving is a real plus. Moving down the left side of the camera, one notices that the D700 has 5 buttons (only 1 of which is dual). The good news is that all of these buttons are very simple in their functions. Going from top to bottom, the buttons are for: entering the menu, protecting images, zooming out in playback, zooming in during playback, and confirming menu selections. 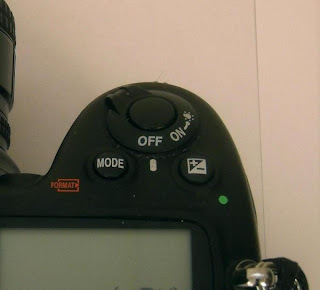 The image protect button is the only one with dual functions (as are common on lesser Nikons) in that it can also be used as a help button when in the menus. Looking at the right side of the D700 and working from the top down, one notices that the 'AF-ON' button which, in in my opinion, is a waste of a button in that it serves the same function as half pressing the shutter button, namely focusing the lens (but without the taking pictures part). Next up is the 'AE-L/AF-L' button, which can lock exposure and focus modes to prevent accidental setting changes by bumping buttons. To me, this does seem like a bit of a waste, too, but apparently some people use it as Nikon wouldn't include the function if there wasn't a demand. The real treat is that the D700 can use this button to also control metering by turning the outer dial to standard, center-weighted, or spot meter mode. Moving down, the multi-selector has an unmarked 'OK' button at the center and the lock switch positioned around the controller itself. Moving down, you'll bump into the 3-way AF area mode selector, another handy, on-camera control. At the very bottom of the camera, you'll find an info button. Nikon D700: top right controls. Moving to the top right of the camera, things are really simple and functional in that the shutter/power/LCD light switch control setup is all built into one simple control. On the right side of the shutter release, you'll find the exposure compensation button nearest the right side of the camera. The left button is an exposure mode function. 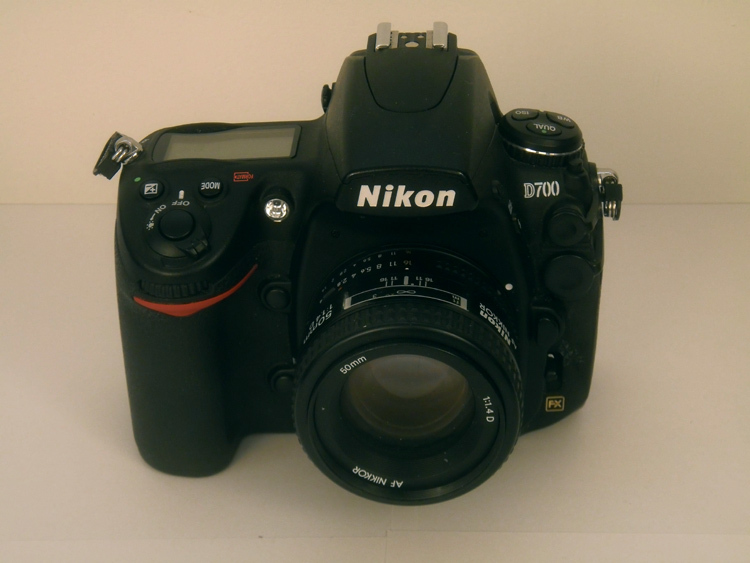 Nikon D700: top left controls. Coming to the top left of the camera, we see functionality exemplified. First, there is drive control mode dial, which includes functions like frame rate, self-timer, quiet mode, and mirror lock up. The letters on this dial aren't as easy to see than on the newer D7000 because, on the older version, the letters are printed on the top of the dial, not on the side. However, the good news is that the lock button is very well placed on the front of the dial so that you can release the dial with your finger and spin it with your thumb. 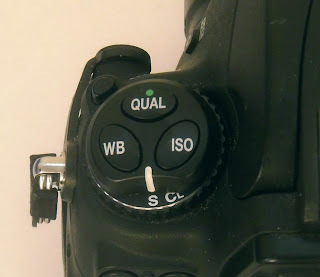 In contrast, the D7000 has the release idiotically positioned behind the dial, which greatly complicates the process of spinning it and thus, changing settings. What really sets the D700 apart from lesser Nikons is the inclusion of single-function buttons for ISO, white balance, and file quality while lesser cameras have a more amateurish mode dial (the ISO, WB, and quality functions are assigned to other, dual-function buttons, or worse, the LCD menu). Finally, onto the front of the camera. On the left side of the prism there is the flash pop-up control. On the left of the lens mount is the focus mode selection lever, with choices being manual, continuous, and single. Personally, this “invisible” button is the only real fault I can find in the D700's control layout. However, this is probably due to necessity as this lever also disengages the camera's mechanical drive AF in a way a button/lever somewhere else couldn't. In addition, there are only 3 settings and one can quickly get to learn them. 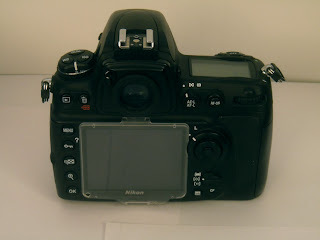 Also, there are connection ports on the front of the D700 which, unlike on older cameras, are attached via a rubber strap so that you can't accidentally lose the port covers. For the final control, on the right side of the camera is the depth of field preview button, which is accessed simply by lifting a finger off the grip. In addition, there is a second button, too. Both buttons can also be assigned other functions. Like I already said, yes, the D700 can be very intimidating for a first-time Nikonian or someone moving up from a lesser Nikon. However, once you get used to the controls, they'll be your best friends as, thanks to so many external buttons, levers, and knobs, one can change just about any setting without resorting to menu diving, which will save untold pictures in the future. 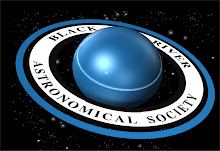 If you found this informative (or at least entertaining), help me pay my bills and check out my Examiner pages for space news, photography, and astronomy for more great stuff.